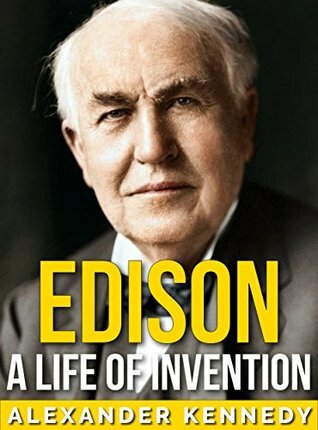 Edison A Life of Invention by Alexander Kennedy is an interesting read drawing out many unknown facts about Thomas Edison who registered more than 1000 patents. We all know the great inventions of Thomas Edison – motion picture camera, electric bulb and so on. He was the founder of General Electric and had more than 1000 patents registered in his name during his active lifespan. But there are a lot of facts that are not known to us that this book promises to acquaint with. There are 7 interesting chapters in this short, precise and intriguing book. The chapters cover the complete life of Thomas Edison in an effective manner starting with his youth span. You will learn the amount of curiosity this budding scientist had during his youth that prompted him to do so many things in a versatile spectrum. He tried some business ventures, worked on various jobs and put his hands on certain inventions at quite an early stage of his life. I loved the way the life of Thomas Edison has been presented in a precise manner. That is probably the key feature of Edison A Life of Invention by Alexander Kennedy. It also helped me in getting to know a lot of things about the great scientist that probably has always stayed behind the bushes would have never touched the day of light. It was interesting to know about the first research laboratory that Edison established at Menlo Park. That probably laid the foundation of his future inventions. Overall, Edison A Life of Invention by Alexander Kennedy is quite an interesting book for every book lover. It promises to motivate you with some great insights of Thomas Edison. You will learn to widen your acceptance level for any ideas generated within. You will learn how and where to find that energy and zeal to make that idea real.